The C&C 30 class has gotten a lot of attention in the last year. If the bold paint jobs alone don’t make a statement, the steady increase of boats on both coasts and top notch pro crews indicates this class is here to stay. This year’s Rolex New York Yacht Club Race Week in Newport marked the first C&C 30 North American Championship, we asked the winning coach to see how Extreme 2 came out on top. 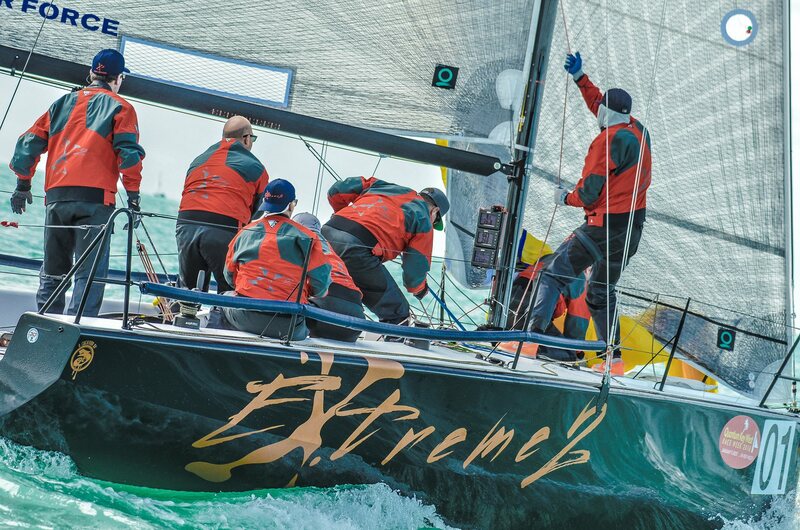 Extreme Success - The first North American C&C 30 Champion, "Extreme 2," at the 2016 Key West Race Week. When teams want to win, one of the best tools can be a set of eyes outside the boat. Especially in a new class where sails, boat setups, and crew positions constantly evolve. To better explain this perspective, we asked Coach Farley Fontenot about his relationship with Dan Cheresh’s very successful Extreme 2 program: winner of the first C&C 30 North American Championship. Quantum: In a class that only allows coaching after the final race of the day, what pertinent information did you make sure to give during race week? Is there too much or too little you can give? Farley Fontenot: There are two parts of each race day that are very important for this type of coaching. The morning before leaving the dock and the after race debrief. The morning session is a review of weather, current, goals of the day and thoughts of what we are going to see out on the course. The evening debrief, should be short and to the point. The crews are tired and but it’s important that we have all discussed this issues of the day. Here is the time we review video, discuss our boat set up, crew maneuvers, watch videoed starts and break them down, and touch on the next day of racing. I always try and leave these meeting on a strong, positive note. And no, there is no such thing as too much pertinent information. Q: What does tactician, Mark Mendelblatt typically want to know? FF: In the mornings it’s not just what Mark needs, but what the whole crew needs. I see it as 4 different information outlets. Driver/Owner, Dan Cheresh: Dan and I drive to the boat early each morning for a little 1 on 1 time. At that time, we discuss where we are at that time in the event. Dan has a lot going on, so I try and focus him on the important points of the day. I want him happy and hungry when he leaves the dock. Tactician, Mark Mendelblatt: we go over everything in the mornings. The weather forecast and then both of our personal thoughts, we discuss the current and how it will play out during the day, and a review of sails, as well as a general plan of the day. Mark is a great “Field General” on the course so he doesn’t need much help on tactics. I try to keep him focused on what is important on the course and what we need from the day. David Shrinner: our “Speed Doctor” each morning we go over all of the possible boat and sail set ups for the day’s forecast. We discuss our gear changes and what to look for should we have speed issues on the course. We always discuss the communication between him and Dan to make sure it is going smoothly. The crew: I want them to leave the dock confident. We discuss the goals of the day, review any issues we had the day before, and finally, any foreseeable issues that may come up on the course. Q: How important is it to get to a venue early and what did the team focus on in Newport? FF: We want to sail two full days before each event. We spent most first days this summer working on a strong fast forward mode, followed up with blow through gybes. The 2nd day is always full race mode, we work on boat speed, racing starts and mark roundings. Our goal, on the last day of practice is to feel as though we are the best prepared team in the fleet for the 1st day of racing. Q: What was the most important information to bring back to the team each day after the C&C30 North Americans? FF: The most important information any coach can bring back each day is an honest and realistic analysis of what happened during day on the course. It amazes me how the view of the team and view of the coach can be so different on tight, close situations. Be able to give the team solid advice on changes that have to be made, listen to their input and don’t be afraid to use their ideas. Dan Cheresh has a fantastic program and we look forward to watching the Extreme 2 team continue to dominate in the C&C 30 class. Along with Stephen Murray’s Carkeek 40 Decision and David Roswo’s J/109 Loki, Extreme 2 took home a coveted Rolex watch. You can see the full results of the race week here.